My recent trip to Canada was full of surprises. Not least amongst them was the decor at my Bed and Breakfast. In my limited experience B&Bs are more functional than fun. My week at Wendy’s was different – here was a visual cornucopia. Each day for a week I worked with my son Joshua on his new house, helping him build a staircase and a front porch. Each night I would collapse exhausted at my B&B; a large, late nineteenth century, family house thirty minutes down the road. Owing to a muddle, I slept in two different rooms during the week; due to my inquisitive nature I snooped into the remaining four. The bedrooms were airy, the beds were comfortable and each morning the breakfasts were homely. Wendy is exactly what a B&B host should be – kind, thoughtful and generous, a mine of information. She is also a prodigious magpie; her house is a repository for a myriad objects d’art of all forms, shapes and sizes that she has acquired over years. I got my first inkling of a something special when, bleary eyed on my first evening, I noticed that the walls were filled with pictures. Unexpectedly, all were to my taste, drawing me in, holding my attention, and giving me pleasure. There were prints, lithographs and line drawings, and a healthy scattering of original paintings, amongst which were many delightful landscapes by members of Canada’s celebrated ‘Group of Seven’ who were at their height during the early twentieth century. The pictures were not pushy with over-ornate frames or grandiose spacing, but hung higgledy-piggledy and somehow unannounced. And there was still more. Suddenly, wherever I looked I began to see interesting and quirky objects just lazing around. On my first evening I had been puzzled by the presence of a multi-coloured, over-sized, hula hoop resting against a sideboard. Next morning I spied on a sideboard a painted stick next to which was a magnifying glass wired on to a rib as a handle. And then, as my eyes became accustomed, similar trinkets large and small began to appear on the windowsill, on the floor, in a flowerpot, coming out of a basket – everywhere and anywhere. And while there seemed no reason for their location, I suspect it was simply because I could not see it. 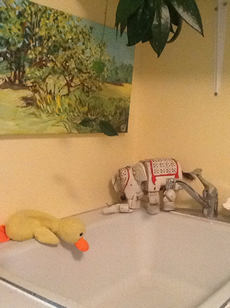 This suspicion was raised when I realised one morning how the trunk of a large wooden Victorian string-puppet elephant echoed the form of the adjacent water spout. But what the nearby duck was up to I couldn’t fathom. And in all this, many of the objects moved around. Moreover, if I moved one myself, as I did one morning, then without a word spoken, by next day it was moved again. I soon discovered that moving the various objects is part of Wendy’s policy – it makes for change and interest. Over the years I have been to the houses of several other eclectic collectors, particularly those of my sisters where, as at Wendy’s, the notion of a clashing of styles or colours has no currency. But rarely before have the objects been quite so dynamic, quite so much a living part of the home. Indeed under her management, Wendy’s house is very much theirs too. My B&B, which offered such wonderful respite, was a perfect foil for the gritty hard work expended each day when I was building the staircase and porch at Joshua’s house. That gave me a totally different pleasure and that is just how it should have been. Dearest Joe, I am curious to know if you tried out the hula hoop and twirled it about your waist …and without a doubt I know you would have spoken to the duck and elephant to enquire what was going on! Joe, I thought this post on B&B in Canada was delightful! In particular it was engaging, eloquent and superbly crafted. Tina read it to me as we drank early morning tea and we were both so impressed with the minute observation converted into rich, engrossing description. For me, one of the best!